Congratulations to "Ptclayton", the winner in Angi's giveaway. Thank you to all who participated! Friday, March 23rd I am facing one of my toughest fears: READING IN FRONT OF A GROUP. Okay, you can stop laughing now. Seriously, I’m already nervous thinking about it. 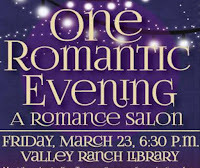 Don’t get me wrong, I feel immensely honored to be asked to be a part of the inaugural meeting of ROMANCE READS sponsored by Elizabeth Essex along with Lorraine Heath and Cindy Dees. 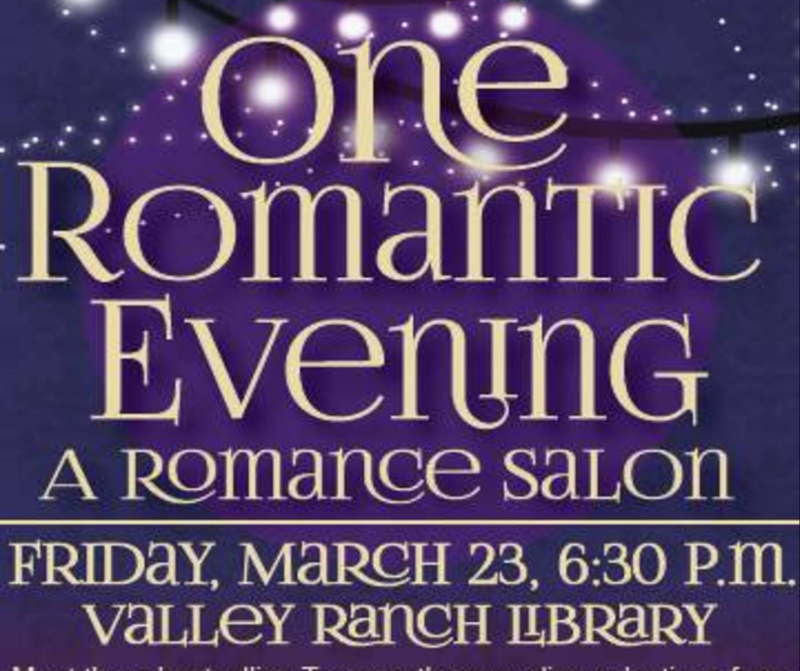 For those of you in the Dallas/Fort Worth area, it’s at 6:30 at the Valley Ranch branch of the Irving Public Library. Refreshments will be served. So back to my dilemma. I need your help choosing which passage to read. Let me know in the comments which scene you would like to hear. Ranger Protector is between the hero and heroine. Ranger Defender is Abby…the villain’s POV. Jack made her feel included. She had no idea if this was deliberate in order to confuse her or if he was genuine. Scratch that. He was the genuine article. There was no talking herself out of that impression. Under the bluff, darkness was steadily moving in. She stepped into the middle of the shallow creek, careful not to slip and drench herself, but there was nothing to see. No lights from nearby houses. No light pollution from a nearby town. They really were in the middle of nowhere. A good place to analyze and organize. They started back up the incline. Jack led the way, holding her hand, steadying her when the rubber boots slipped. Back to the deck, he stepped up, then lifted her with both hands. A spark. A moment of anticipation. If they’d been on a date, she would have stood on her tiptoes until he kissed her. She might have even leaned in and kissed him first. But they weren’t on a date. They were hiding out in the Texas Hill Country. And while she debated with herself about what to do, he let her go and practically ran the length of the porch. “I’ll grab the food,” he shot over his shoulder. There might be a million and one questions about who was after her and why. But one thing was abundantly clear. Ranger Jack MacKinnon was an honest man and dangerously attractive. She already respected him and trusted his judgment. Getting involved would be easy. So how distracting would it be trying not to? “I could never have assumed that Rashid would react to the suggestion before he left the hospital.” Abby pulled at her cuticles with tweezers. She spoke to the only person completely familiar with her work, herself. Several doctors, including Roberts, had ordered her to stop, stating it was unhealthy to pick at her nails. They were wrong. Her skin was raw, but there were still pieces. She picked more furiously before looking up into her red, freshly scrubbed face. Certain there was another layer of dirt on her epidermis, she obtained another washcloth, rubbing and scrubbing as hard as she could. Setting the cloth onto the counter, she switched back to the tweezers, picking until the bright red of her clean blood seeped around the nail. She went to the cabinet to remove the last washcloth from the sealed bag. She would begin the cleansing process again until she was positive the germs from walking on an unfamiliar street were no longer present. “I can never get clean enough,” she answered behind the cloth. “Yes. I need to identify the woman in the truck.” The tweezers caught her eye. She dropped the newer white cloth on top of the metal but immediately had to place them in the sterilizing jar. 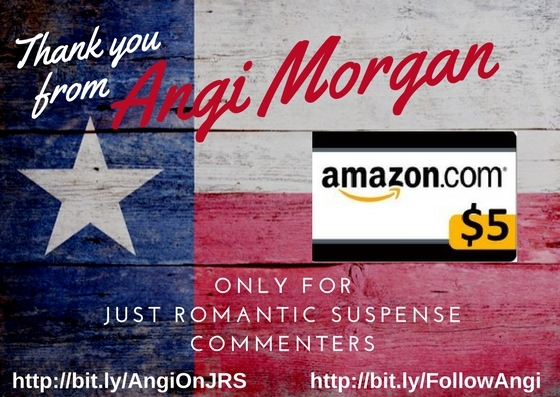 Giveaway on JRS ends at midnight March 21st. Contestants enter drawing by leaving a comment on Just Romantic Suspense. Which would you want to hear me read? Abby is sort of creepy. I would pick the Ranger Protector scene because it highlights both the perilous situation that they are in, the beginning of the romance between them and a touch of humor. I would also pick the Ranger Protector scene, reasons are more or less identical to Joan's above. But I have to say that Abby excerpt was also interesting... first I skimmed it, then there was some confusion on my part 'whait, what did I just read, heroine or villain?? ', then I read it completely and you're right, she is definitely creepy. It left me in the state 'I'm curious for more but not sure if I want to meet Abby again', something like a horror effect hahaha. But as much as it was interesting, I don't think it is right passage for public reading. Thanks Marija. I love your thoughts on Abby. Protector scene is my choice... I was never liked speaking in front of others, but I always managed... good luck! Thanks Colleen. I need it. I think I'll be in jeans and boots...might even sneak in my old straw hat. I can speak in front of people fine...it's the reading. I'm not a great actor AT ALL !! and yes, refreshments will be served. I would go for the Defender scene - that excerpt grabbed me and gave me the willies too! In RS there is always a romance, so reading the Protector excerpt seems like the safe option - what is different about each book is the suspense and you have written a compelling/repelling adversary so I would go with her - lots more for people to think about! Have fun! Those are great thoughts !! Thank you. Or you could talk really quickly and read both! Heeee ! I'd go with Protector because it's a "romantic evening" and that excerpt has a soupçon of romance. That's a very strong point !! Thanks, Kenderly !! Elizabeth wanted it to be one of our most recent releases. I'd be nervous too. The PROTECTOR SCENE for me. I need to practice. My goodness, it's already Wednesday. I choose the Protector Scene. The first line draws me in so that I am looking for "the best option'. I love it !! Thanks, Jan !! Protector does seem to be more favored for the reading !! I would prefer the Protector scene. It gives you a better idea about both of the characters and the relationship. A friend mentioned it might take too long to explain about the villain in Defender without spoiling the book. And that's why I thought about using it. Thanks Ami !!! This seems to be the favorite. Thanks Joyce. Leading with the most votes !! Thanks, Tina.